Sage MOD Fly Rods, high performance for short accurate casts! New to the Sage line up, the Sage MOD Fly Rods feature rod weights from 2-6 for single-handed rods, and a 6-7 weight Spey option. What Sage had in mind with these rods are high performance casting machines perfect for tight, accurate casts at short distances in Spring Creeks and Freestone rivers. The Spey options are also perfect for larger water, where you'd cast for sea run cutthroat, or summer steelhead. They work just as well with deep-loading Skagit lines, or precise Scandi heads. Throughout this line Sage describes the action as moderate, (hence the name MOD). Moderate action that isn't too fast or too slow, perfect for any matching weight Airflo, Rio, or SI tapered fly line. Made from highest quality graphite blanks, these rods are Jade colored with yellow-green wraps and black trim wraps. Fuji ceramic stripping guides, chrome snake guides and tip-top complete the rod. The single-hand rods have a zebra wood insert with gloss black anodized aluminum up-locking reel seat with a Super Plus cork snub-nose half-wells cork handle. The Spey models feature a gloss black anodized aluminum down-locking reel seat with a Super Plus cork fore and rear grip. These rods come in a black powder-coated aluminum rod tube with Sage medallion with a black rod bag with jade logo and model tag. 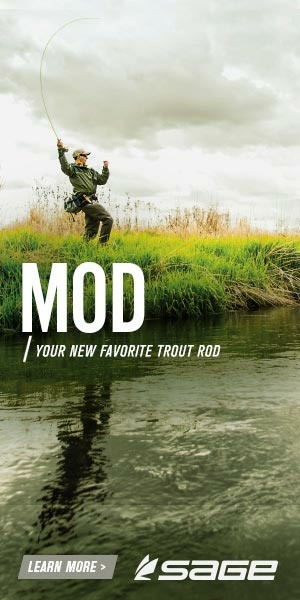 The MOD singled-hand fly rods are available in 2, 3, 4, 5, and 6 weights in 9-foot lengths, and the Spey models come in a 6 and 7 weight in 13-foot lengths. NEW Sage MOD Two Handed Rods are honest MODERATE ACTION specialty Spey rods that will delight summer and winter steelhead anglers fishing small and modest size fish and rivers. Here us why you should purchase your next SAGE rod from the Caddis Fly Angling Shop. Do your research anywhere you want, but keep this in mind please: we are a home town fly shop with tons of rods in the back room and on the floor in racks. We fish SAGE and a ton of other fly rods too. We appreciate each rod manufacturer but above all, we respect our customers, and we NEVER try to push anyone into a rod or brand just to make a sale. If you like this or any other fly rod, we will help you line and reel and fish the beast. And we will be here after the sale, in person, on the phone, and on email, to support your sale and any warranty issues after the sale too. That is why you should allow us to serve your fly fishing needs. Forty years in business, we are planning on the next forty years right now. Product and Guide Reviews plus video on the NEW Sage MOD Two Handed rods plus our recommendations of practical fishing applications. Let us face reality here: many steelheaders would prefer to fish moderate action Spey rods rather than the majority of very fast or very slow rods currently on the market. Many of our clients fish moderate size rivers where modest sized fish would be the most fun to catch on slightly softer rods. These conditions do not require ultra fast actions or 100 ft casts to cover the water and swing the fly. The new for 2016 SAGE MOD Two Handers are perfect for these conditions. 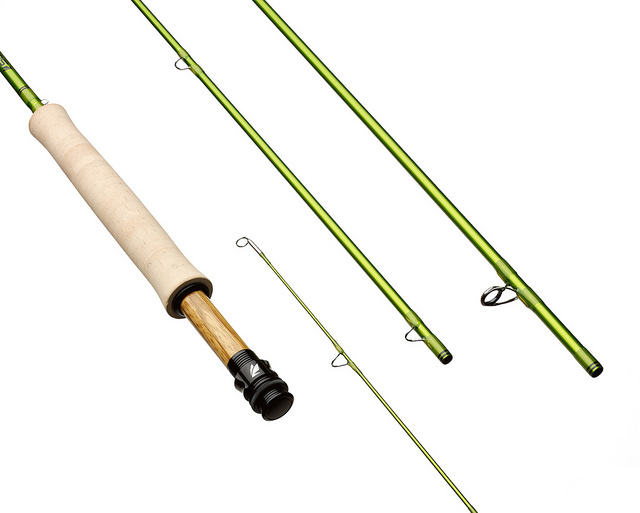 Selecting the right Sage MOD Two Handed rod. In an era when fly rods are diverging in two directions: ultra slow to ultra fast, the Sage MOD offers us the option of an authentic middle of the road, moderate action rod that we can feel load into the cork, but that does not go to ultra slow and ultra deep. Why only two MOD options? When SAGE looked at the world of summer and winter steelheading, they concluded that these two handers would meet the needs of the vast majority of Spey fishers looking for summer and winter steelhead moderate action fishing applications. The options of a 6 wt and a 7 wt cover the SWEET SPOT for most steelheaders fishing summer and winter fish. Best line matches? The SAGE MOD fishes very well with a wide variety of lines from RIO, AIRFLO, and SA. You may already have lines that will fish admirably with these new SAGE MOD rods, or you may browse for new lines, or heck, give us a call and ask so we may help you select a specialty line for your new MOD. Saying that the action is MODERATE understates the power of these rods. The potential power generation of any fly rod is not directly or necessarily correlated with the rod action. Ultra fast rods can generate tremendous power, allowing for very long cast execution. The same is true for some ultra slow action fly rods: some of these rods are also very powerful and can execute very long casts. SAGE MOD two hand rods generate plenty of power to execute long casts, but they achieve this with a moderately full load of the rod that is especially pleasing and relaxing, and is still quite intuitive to the caster. Sage MOD 6130-4 Spey fly rod: This two hander should be perfect on smaller steelhead rivers and should be worthy of many MOUSING scenarios in Alaska and Russia too. South America steelhead, anadromous browns and the like? You bet this rod will deliver. 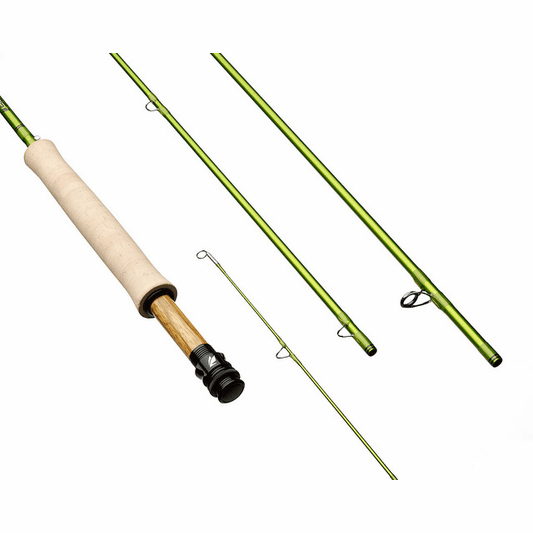 Sage MOD 7130-4 Spey fly rod: Summers and winters. Skagit Heads with heavy sink tips. Scandi style heads and lines. Big heavy Intruders. Small damp and skated flies. These are all on the menu for this honestly moderate action two hander. Thread wraps are Yellowish green with black trim. Reel seat is glossy black anodized aluminum up lock style. Cork fore and rear grips are SUPER PLUS. Rod bag is black with Jade colored logo. Aluminum SAGE rod tube is black powder coated with official SAGE medallion.